This system complements last week’s idea. It’s heavily influenced by the various unit-based battle systems designed over the years, the most recent of which I can remember are from Ultimate Campaign, A Song of Ice and Fire RPG, and a (now-apparently-missing) post Squaremans did about D&D battles. Unlike all of those systems, however, this system isn’t really meant to be a strategic/tactical simulator. It uses very simple numbers that you just add up, with a few minor tactical choices just to give a small level of fun, kinesthetic interactivity. What it’s really meant to do is to put numbers to a story-based war story. The focus is on following quest goals to accumulate as many squads and heroes as possible to form a bulwark against an oncoming enemy horde. When the armies actually meet, your only real questions are whether you have enough units to defeat them, whether you can hold them off until reinforcements arrive, and whether you’ll manage to keep enough of your army through the casualties to face the next threat. A squad is a unit of soldiers of similar level, class, gear, and other fighting capabilities. The basic understanding is that they’re of a typical size for a squad: around a dozen individuals. If the squad is made of monsters, it might instead be 3-4 large creatures, 1-2 huge creatures, or 1 even bigger creature. Past a skirmish of a few hundred combatants, the system could get inundated with cards and adding. If you want to simulate larger battles on a regular basis, have your units represent larger groups of troops to taste. The trick is just making sure all groups are basically equally sized; the system won’t make sense if you have a squad on one side matched to a century on the other. Name is just to distinguish it more easily. If you have multiple units of the same type, give them each individual designations. Type is Infantry, Cavalry, or Ranged. Those designations are explained in more detail below. CR is a direct link to the individual CRs of the squad members. A squad of typical Ogres is CR 3, because that’s the CR of Ogres. Count a CR under 1 as 0: levies of NPC classes or just very low level characters can have a CR 0. Morale is equal to its CR plus a bonus of 0-20 depending on how well its members are treated and how naturally engaged they are. This number may change often over the course of a war. Morale is CR + 10 for most troops that are not especially well or poorly treated. 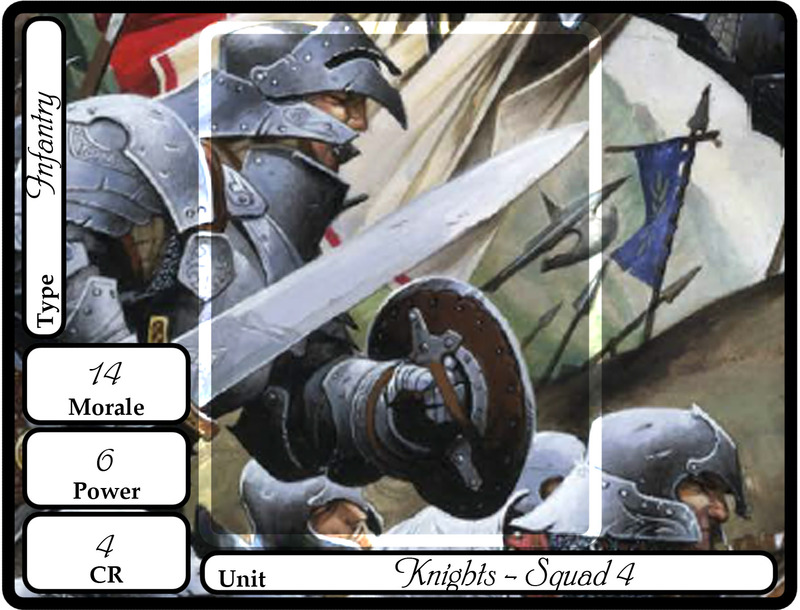 An example card might look like these links for Knights or Peasants. Add the hero’s Cha bonus to the unit’s Morale for all purposes. Add the hero’s Level to the unit’s Power for all purposes. 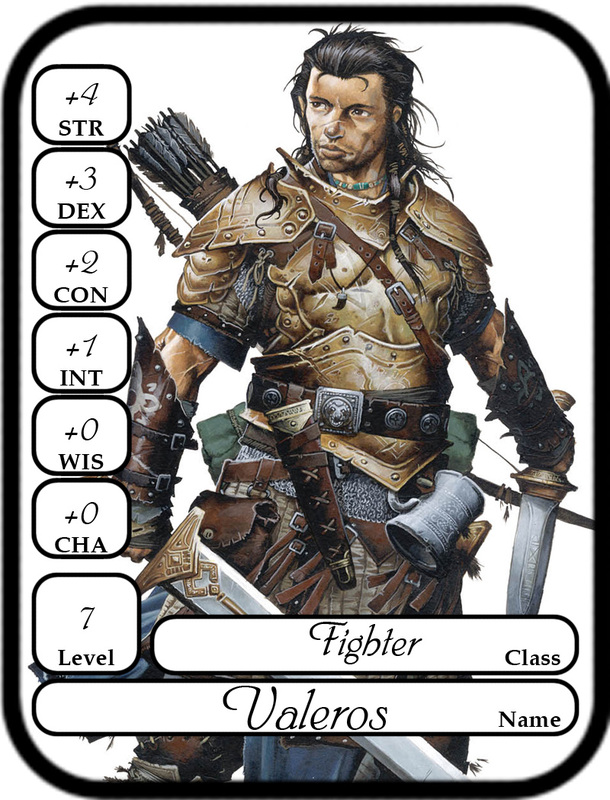 Effectively, a theoretical CR 20 unit with maxed gear and morale attached to a high-Charisma 20th level hero would have Morale and Power 47 or so. Battles happen in turns that often take an hour or two. These are heavily story driven, and may take longer in different conditions. Additionally, civilized armies may only fight a few turns a day before retreating for the night. All these factors are important because, after the initial meeting, it may become quickly obvious that one side needs to consider retreating or trying to hold out for reinforcements, and the longer time frame makes that more reasonable. Based on the terrain and other advantages, the GM can assess either side a global bonus to the Power total (e.g., +20 to the final Power tally) or individual unit Morale (e.g., +2 to each unit’s Morale). Each side places all ranged units in the back, away from the front lines. Surprise and flanking are decided: if one side starts the turn at such a disadvantage, its general has to place down a card first (and may have to place down more than one card before the other side places any). After the initial infantry unit(s) is placed, the other general places an infantry unit faced against one of the unoccupied infantry cards on the other side (basically, you have to match card to card and cannot have two cards to one card unless you have a major numbers advantage). Each side takes turns placing infantry in a “snake draft” style. For example, GM – Player – Player – GM – GM – etc. Getting to choose which card to match with one of yours is a big advantage, so this method spreads out the advantage. If one side still has infantry cards while the other side has all infantry cards faced, that side can either double-up cards on the infantry line (i.e., reinforce one infantry unit with another so an enemy unit has two-on-one) or place an infantry unit against an unoccupied enemy ranged unit. 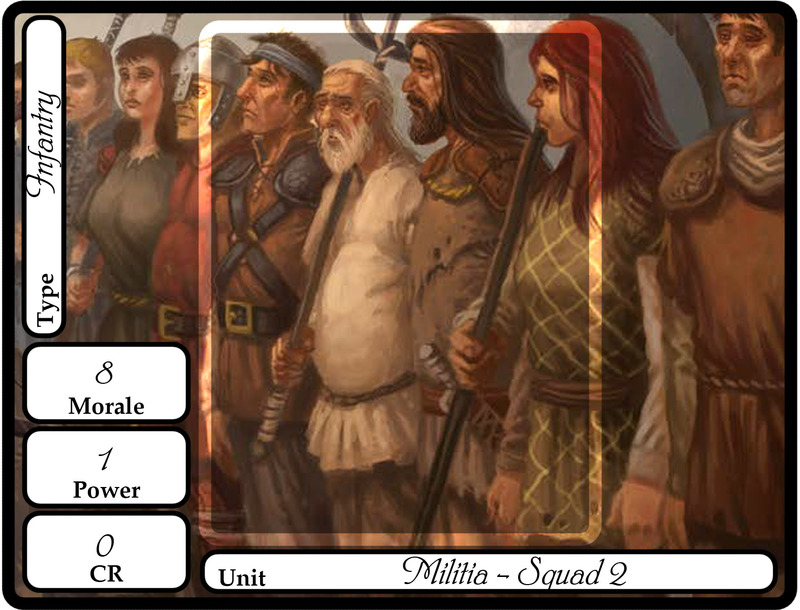 Once all infantry cards are placed, the sides take all cavalry cards into hand. Take turns (in the same snake draft order) replacing your side’s infantry units with cavalry units or placing cavalry against unoccupied ranged units. Essentially, the cavalry is fast enough to hit the enemy at weak points. Put all replaced infantry units to the side. Finally, repeat steps 2-6 with the displaced infantry units. Now compare all units that are facing an enemy unit. If the enemy unit’s Power is greater than your unit’s Morale, put a counter on the card to show that it has Broken (both units can break simultaneously if they have high Power but low Morale). This indicates that the unit has taken enough casualties to turn tale and flee after this turn. You’ll still use that unit’s Power for this turn, but will set it to the side after the turn. If a unit has two-on-one, treat the two units as a single unit (i.e., add its Morale and Power together for purposes of Breaking). Ranged units treat their Morale as half for purposes of Breaking. Total up the Power on both sides. Whichever side has the higher total is winning the battle for the turn. The loser has to Rout a number of units based on the difference in Power totals. You can’t Rout units that have Broken. Remove units of your choice until the total Morale of Routed units equals or exceeds the difference. For example, if you had a total Power of 300 and the enemy had a total Power of 340, you’d have to Rout 40 Morale worth of units. Continue Fighting: If you’re still relatively evenly matched, you might decide to go to another turn of battle. Sue for Peace: If you took heavy losses against a civilized foe, you might offer terms to the opponent rather than risk a massacre. Retreat: You can choose to retreat after any turn, to buy time or lure the enemy into a stronger battlefield. Realize You’re Destroyed: If all your units are Broken or Routed, you have lost. If you won or sued for peace successfully: Recover all Broken units, Broken heroes, and Routed heroes. Recover half (your choice) of the Routed units (the rest took too many losses to continue to meaningfully contribute). If you retreated or were destroyed: Recover all Broken heroes and half (your choice) Broken units and Routed heroes. All Routed units are lost. Some of the broken units scattered never to return and your routed units weren’t able to be saved. The GM may choose to award advancement to units and heroes that survived, increasing their level/CR. Morale of each unit is also highly likely to be affected by anything other than a narrow win/loss. This is a further development of the ideas from this post, with a lot of inspiration from the Assassin’s Creed 2: Brotherhood assassin trainee mini-game. It’s about letting players manage a much larger force of heroes to set the context around a game of D&D. It’s intended for warfare epics, or just situations where there’s an awful lot going on in the world and the PCs are part of a larger organization all splitting up to deal with it (rather than just a small band of adventurers). In this system, players accumulate ally heroes. Some of these can come from the normal campaign sources like Leadership cohorts. Most should be story rewards for hard-won challenges, and many of them should require extra effort to acquire. The more ally heroes the players collect, the more capable they’ll be in the offscreen challenges. For the most part, you’ll only need the hero’s ability scores, class, level, and name. 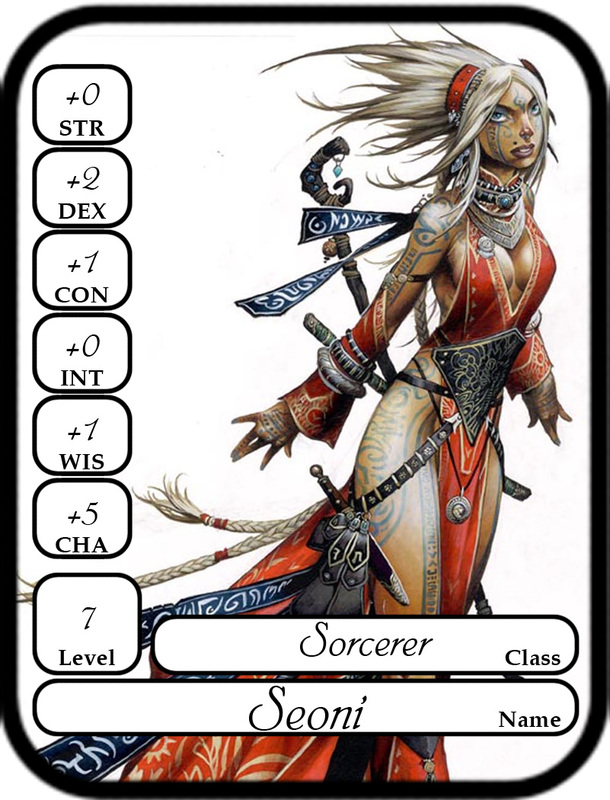 Ideally, you’ll print them out on cards that the players can handle (like this or this). The goal is to give them something tactile to arrange visually around the table. Often, a mission will have a distant Destination that will take the group time to reach before they can work on the mission proper and to return from when the mission is complete. This travel time is tracked toward when the heroes become available again (or when other events happen while they’re unavailable), and can be circumvented normally by access to different travel methods and spells. All missions have a Frequency, which indicates how fast the heroes can make progress. Generally, this is on a similar scale for all the current missions (a series of diplomatic and information-gathering missions may take days, while spreading out to prepare a city on the eve of battle may be in hours). The mission’s Goal Number is a total that the heroes are trying to meet to make the mission a success. A mission’s Ability Score indicates which of the hero’s scores is added to her level to generate progress toward the goal number (e.g., if Valeros and Seoni were both assigned to a Dex-based mission, they’d add 19 toward the goal number once per Frequency, due to adding their Dex bonuses of +2 and +3 to their level 7). A mission might have a Threshold of another ability score and a number that must be met to begin the mission. This totals only the heroes’ ability score bonuses, not their levels. For example, an attempt to sneak into a walled city and gather information is a Charisma mission, but might have a Dexterity Threshold. In that case, Seoni might take Valeros along mostly for his high Dex, even though he’s not very charismatic. If the mission had a Threshold of Dexterity 7, they’d need at least one more hero with a Dex bonus (and someone with a Dex penalty would set the Threshold back). Finally, a mission might have a Danger Rating, which means that combat is likely to occur in the mission, and someone could die. For each hero whose level is lower than the Danger Rating, roll a d20 once per frequency; if the result is equal or lower than the difference in level and Danger Rating, the hero is killed on the mission (and doesn’t contribute further to the Goal Number past that point). If Seoni and Valeros went on a mission with Danger Rating 9, they’d each have a 2 in 20 chance of dying each time they checked the Frequency. Sometimes, it’s better to let a mission wait than to spread one’s heroes too thin. If the GM wants to track it, record the Danger Ratings of all successful missions on the hero’s card, and level the hero up after the total equals five times the NPC’s level (i.e., five equal-level missions, more lower-level missions, or fewer missions with a risk of death). All missions should give some useful reward for completing them. That may be in the form of treasure that the heroes share with the party, information that provides a real benefit, another heroic ally, or an asset for the battle system (see next week’s post). There should generally be enough going on that the players can’t accomplish everything unless they’re very good at matching their allies to missions and/or have worked hard to have a lot of spare allies. Just make sure that a lot of the missions are optional, simply making things easier rather than screwing the players if they can’t accomplish them. Missions should often have a window of time in which they’re available; careful planning can let a hero do two missions before the second one’s window closes, but taking a mission’s availability for granted makes it go away. Strength missions might be heavy labor, training troops, or physical competition. Dexterity missions generally involve stealth, acrobatics, or other roguish activities. Constitution missions might be ordeals or anything else where simply enduring leads to victory. Intelligence missions involve research, puzzle-solving, or intellectual competition. Wisdom missions are often about scouting, discerning truth from falsehood, or religious activities. Charisma missions cover any kind of social information gathering, diplomatic envoys, or distractions. For missions with a Danger Rating, the GM may choose to allow the mission’s Ability Score to just be “Prime Requisite;” the hero uses the ability score bonus most appropriate to his or her class. The typical way to use this system is to allow the player characters to send allies to take care of stuff that’s useful but not something you’d want to run all the way through. Another option is that all of the heroes in play are potential PCs, and when the players are assigning the heroes to different missions, they’re effectively portraying whatever non-adventuring leaders organize the group. 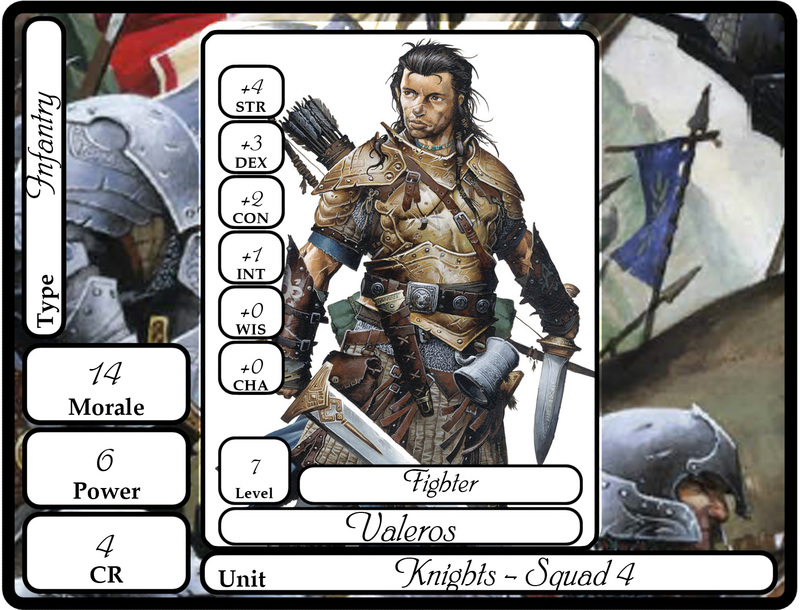 In this style, the players can pick up and play any of the heroes when the GM decides the situation calls for it. This might be a single, largely-descriptive scene to conclude a mission, or may be a full series of encounters (particularly in a mission with a Danger Rating; this moves the chance of death from a die roll to the results of the actual encounters). The players may not know which missions will lead to opportunities to zoom in on the action, so may take to splitting up characters they enjoy playing onto any missions that are remotely appropriate rather than what’s most tactically sound, so this style probably works best if your players enjoy the roleplaying challenge of spontaneous playing different characters. It also means that you’ll need full stats for most of the heroes, rather than just the ones on the card.